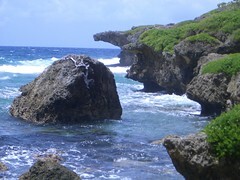 Another gorgeous day in Guam and we went on our third straight Boonie Stomp. This will probably be the last for a few weeks as we plan explore other beach spots on our own. Today’s stomp was rated difficult and difficult it was. I tried to turn back about 100 feet into the hike and the guy behind me wouldn’t let me. Glad he didn’t because it is a beautiful cove in which I got to do a little snorkeling and the way back up wasn’t nearly as scary. 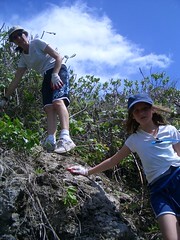 Fadian Cove is located on the Northeast section of the island and the trail is very steep. I’m not joking when I say I was “stuck” in a couple of spots for fear of sliding a long way down. 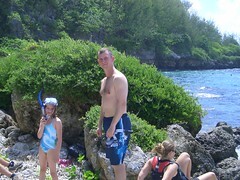 Once again, it was all worth the effort when we got to the cove and were able to swim/snorkel. 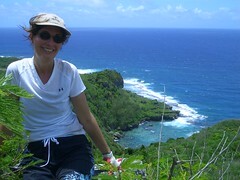 Here I am happy to be back at the top overlooking Fadian Cove ~ isn’t the water glorious looking?